1. Go to the “Manage Pages” section and create a new page. 2. Make sure that when you create the new page that you choose to “Edit this page manually”. It will enable you to insert html or paste information from other website sources. 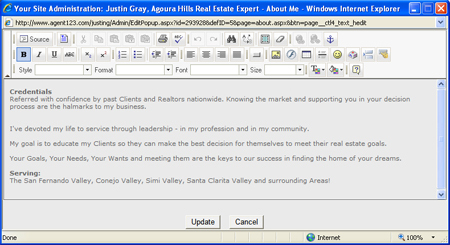 To add content to your new page, click on the page in the left nav of your Agent Center. The page will open up and allow you edit. 1. Click the “ ” icon to edit the page heading. 2. Click on the “ ” icon to edit the text of the page. This area can be used in number of ways depending upon your need. If you have knowledge of html, the source code can be modified to allow you insert html. This is done by clicking “Source” in the full text editor where everything gets converted to code. Paste in your code to the appropriate area and click “Update” when finished. Lastly, you have the ability to manually input any text, links, images or buttons to this unique custom page. Just follow the appropriate help files for information regarding this in the table of contents. 3. Click the “Add image” link to far right of your Manual Custom Page to upload image(s). – The “ , ” icons will move your image up or down in your list of images. – The “ ” icon will delete the image.